A list of features already implemented in pdfPost. 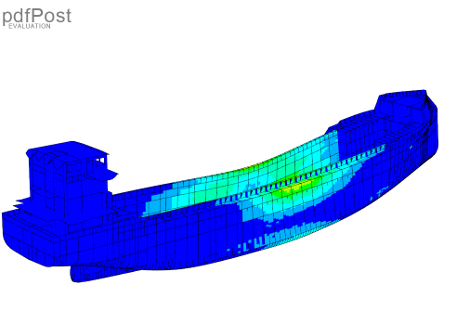 We’re doing our best to suit the needs of engineers. Any questions related to the functionality of our software can be asked at pdfpost@bpsolutions.com.pl. 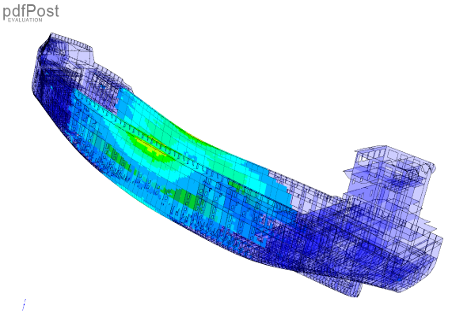 Our aim is to cover full spectrum of FEA post-processing capabilities within PDF 3D engine. The TO-DO list is long and pdfPost will be systematically updated with new functions. If yo’re not sure if pdfPost suits your needs, do not hesitate to contact us. pdfPost allows user to present FE geometry using a variety of options. Please note, that all images presented on this web page, were taken directly from PDFs created in pdfPost. Presented geometry is fully interactive (pan, zoom, rotate etc.) within PDF using compatible browser. Elemental display (stress plot). 9 primary colors. Elemental display (stress plot). 9 primary color, 64 secondary colors. Nodal display (deformation). 9 primary, 64 secondary colors. Elemental display (thickness). 16 distinct colors. Elemental display with a single color transparency. Display based on nodal and elemental values. Single color can be assigned to a value or a range of values. Full control over colors used in geometry (custom color legends). Full control over values and ranges of values in FE geometry. Transparency available for elemental display. Control over PDF page layout. Multiple 3D plots within one PDF. 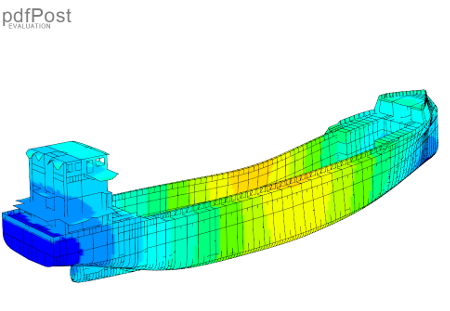 Ship model with clear distinction between main structural elements. Component structure can be fully controlled by user using groups and subgroups. pdfPost supports line, plane and solid elements. pdfPost is suitable for large projects. 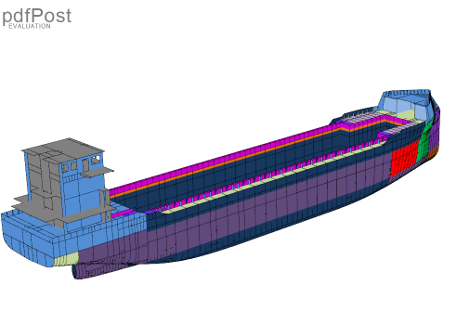 Models with 575,000 elements (Tetra solid) and over 975,000 nodes were successfully exported to 3DPDF. pdfPost supports neutral, CSV based input. 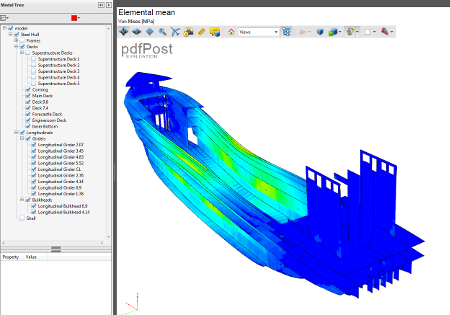 Data from any FEA software (with scripting capabilities) can be exported to the 3DPDF. All project data stored in XML files. Configuration files can be used in the future or on different projects. pdfPost utilizes full CPU power during conversion process (multithreading). 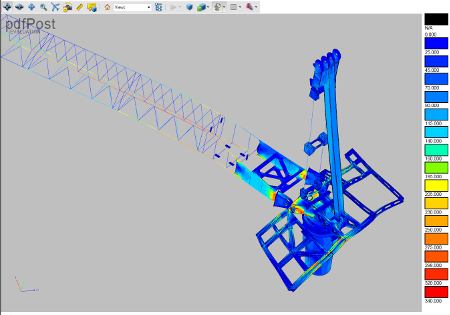 User can customize 3D PDF page layout or embed 3D geometry using ex. Adobe Acrobat Pro. 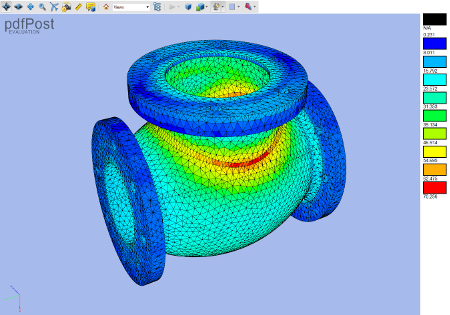 Plug-in for ANSYS Mechanical users. 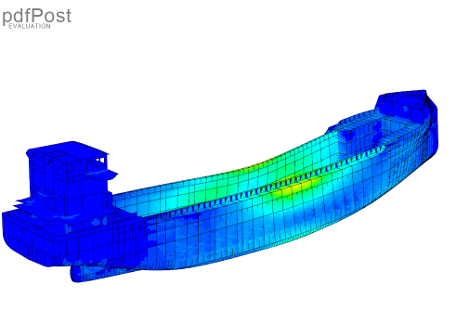 Macro libary for ANSYS Mechanical APDL. pdfPost allows to save 3D geometry outside the PDF (U3D format).